China is a country of superlatives and contradictions, especially when it comes to energy – it is not only the largest producer and consumer of coal, but also the largest investor in renewable energy. Since 2010, China has been the world’s biggest and fastest growing market for wind power, which the government has prioritized for its cleaner energy and job creation potential. But waste and poor planning have left many new wind farms idle or disconnected from power grids. Curtailment occurs most often in northern China, which has cold and windy winters that create a high, stable base-load demand for heating. To meet this demand on a consistent basis, coal-fired power plants which produce both heat and electricity must remain in operation. This naturally caps the amount of energy wind farms can contribute, regardless of grid connectivity, since most are only capable of providing electricity. In Inner Mongolia, Jilin, and Gansu provinces, wind power curtailment has been as high as 20 percent. There has been some recent progress towards better integrating these new power sources. The national plan is for 11 percent of the country’s energy consumption to come from renewable resources this year, and many more wind farms have been connected to power grids, with the number of disconnected turbines dropping to 19 percent in 2012 and 15 percent in 2013. A number of wind-powered electric heating projects have also been piloted in northern China, which has significantly reduced curtailment as well as coal usage. Last year, the national average for overall curtailment dropped to 11 percent. The United States, notably, has also struggled with underutilization of wind power. In 2009, up to 17 percent of U.S. wind power was curtailed, though this dropped to only four percent in 2012 and as low as one percent in 2013. “China’s current wind bases can serve as a laboratory for global learning, with many countries standing to benefit from the lessons of China’s rapid wind power expansion,” said Joanna Lewis, a former Wilson Center fellow who wrote a book on China’s wind industry, in an interview. Still, if China is to ever reach the clean energy future it wants – and others have urged it to towards – these lessons will need to be learned quickly. 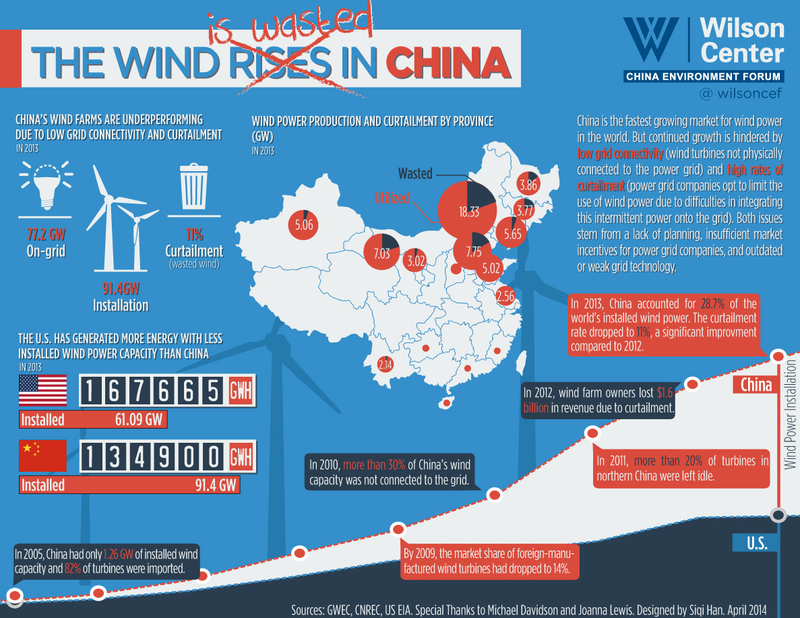 Sources: China Electricity Council, China National Renewable Energy Center, Climate Central, The Energy Collective, Forbes, Global Wind Energy Council, National Energy Administration (China), National Renewable Energy Laboratory (U.S.), U.S. Energy Information Administration. Special thanks to Michael Davidson and Joanna Lewis. Infographic: Siqi Han/Wilson Center’s China Environment Forum. Topics: Asia, China, China Environment Forum, climate change, coal, consumption, development, energy, environment, featured, mitigation, U.S. The habits of a lifetime is difficult to change. The waste that comes from central planning is manifested again here. China will find it difficult to extricate itself from its root of centrally planned economic tendencies.